​After three years we've done it! 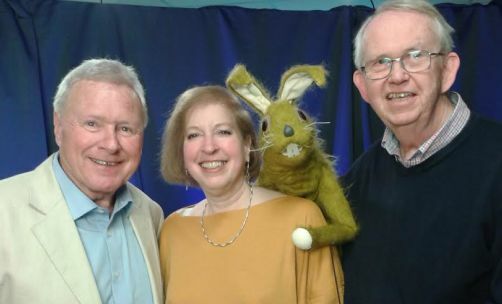 The original PIPKINS team, puppetmaster Nigel Plaskitt, writer Susan Pleat and I have joined forces with Paul Jomain, puppet creator and writer/ lawyer Robert Taylor to create and produce MONTY & CO, a brand new pre-school live action puppet series for a new generation of children. We've just finished filming 34 x 11 minute episodes which Susan and I have written. The icing on the cake is that Kaleidoscope Classic TV has found a lost episode of PIPKINS. The BFI will be showing that episode, written by Susan Pleat, in their MISSING BELIEVED WIPED season this Saturday August 11th at 3:30 PM. As an extra treat for PIPKINS fans, David Hamilton will be interviewing Hartley Hare to find out what Hartley's been doing all these years. Best of all following that, the BFI will be presenting the world premiere of MONTY & CO. They'll be screening an episode that I wrote, STRICTLY EDDIE, so what better way to launch our new series? There are still tickets available so please join us to relive your childhood or start your second one! Nigel Plaskitt, a.k.a. Hartley Hare, writer Susan Pleat and I first met many years ago when we made the hit ITV series, Pipkins. It ran for ten happy years. Nigel, Susan and I have remained friends which is why, along with puppetmaker supreme Paul Jomain and ChuckleVision writer (and lawyer/ barraister) Robert Taylor,​ we've created a whole new children's series, Monty & Co, for a new generation. It'll be hitting your screens soon. We're pleased to say interest in Pipkins has always remained strong. 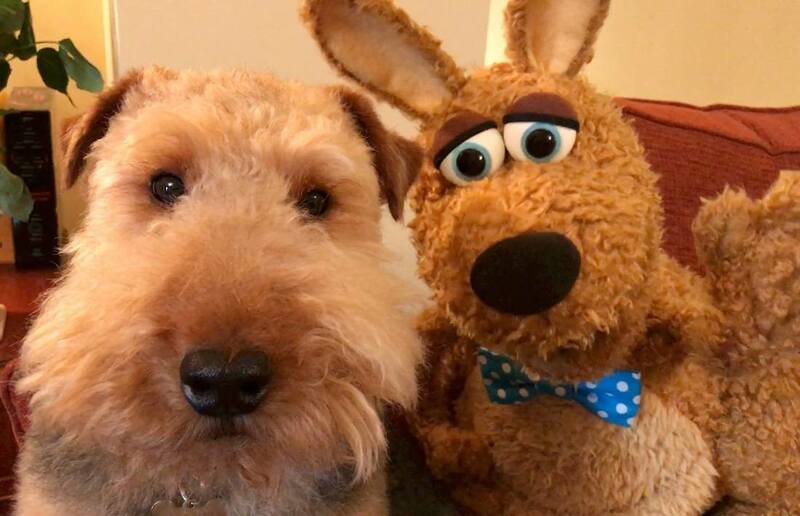 When Nigel and I went on the David Hamilton Show to talk about Monty & Co, Hartley insisted on being brought along as well. And now Network has released Pipkins The Collection on DVD. I've revisited Pipkins in an article on their website. I hope you enjoy it and the Pipkins DVDs too. Charlie is Nigel Plaskitt's dog. Nigel is best known as Hartley Hare in Pipkins as well as being the PG Tips Monkey and countless other characters. We're working together on our brand new children's puppet series, Monty & Co.
We hope you'll love Monty & Co as much as Charlie does. Monty & Co is a new children's puppet series made by the creators of the hit ITV show, Pipkins, which ran for 10 years. 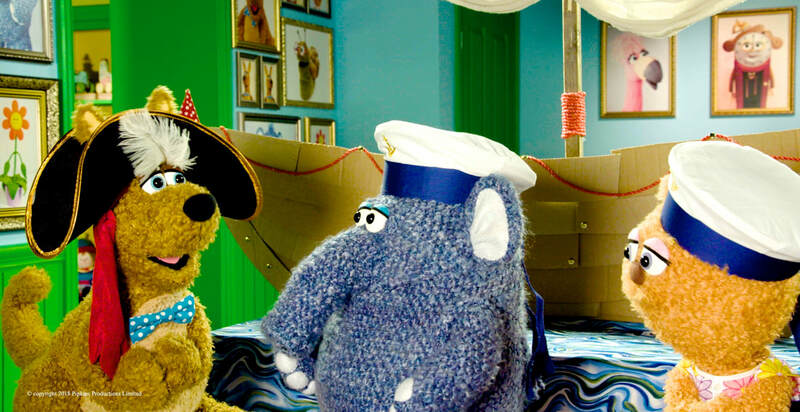 Our award-winning team has also worked for The Muppets, Sesame Street, Avenue Q and Disney and much more. Please have a look at Monty and his friends! I'm pleased to announce our exciting new upcoming series, Monty and Co! 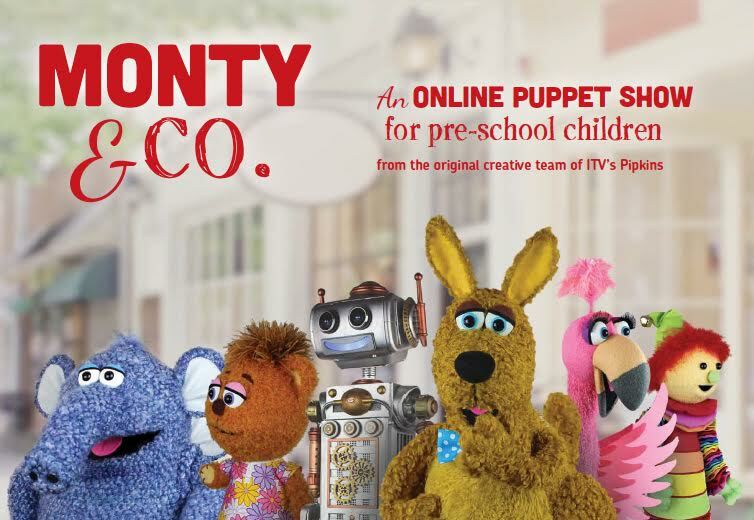 Monty & Co is a new online puppet show for pre-school children --- from the original creative team of ITV's Pipkins. Once again Nigel Plaskitt, Susan Pleat, Paul Jomain, Robert Taylor and I are joining forces. The result is a fun-packed, entertaining, educational new series that parents and older siblings will enjoy as well as pre-school kiddies. I'll keep you updated on our progress. Monty & Co will be coming to your screens soon!